Low-molecular-weight heparins such as enoxaparin are preferred for prevention of venous thromboembolism after major joint replacement. Apixaban, an orally active factor Xa inhibitor, might be as effective, have lower bleeding risk, and be easier to use than is enoxaparin. The primary outcome in this Lancet study was the composite of asymptomatic and symptomatic deep vein thrombosis (DVT), non-fatal pulmonary embolism (PE), and all-cause death during treatment. The primary outcome was reported in 15% of apixaban patients and 24% of enoxaparin patients (relative risk 0·62), absolute risk reduction 9·3%. Major or clinically relevant non-major bleeding occurred in 4% of patients receiving apixaban and 5% of treated with enoxaparin. The authors concluded that apixaban 2·5 mg twice daily, starting on the morning after total knee replacement, offers a convenient and more effective orally administered alternative to 40 mg per day enoxaparin, without increased bleeding. Apixaban versus enoxaparin for thromboprophylaxis after knee replacement (ADVANCE-2): a randomised double-blind trial. The Lancet, Volume 375, Issue 9717, Pages 807 - 815, 6 March 2010. 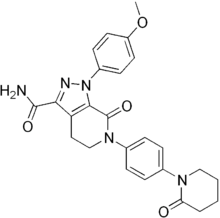 Image source: Apixaban, Wikipedia, public domain.